Staying on top of the energy market and the number of tariffs available is a real challenge. For most people, it's too bewildering to bother switching energy providers. Others have nagging doubts about finding a deal, only for another one to pop up tomorrow. And, for some, there’s a fear that a switch will result in charges or a fine. For those that do switch, energy price comparison websites (PCWs) have become the common way to choose and move between different energy providers and tariffs. It's easy, right? Not exactly. There’s a 96.59% chance you won’t find the cheapest energy deal using price comparison sites. 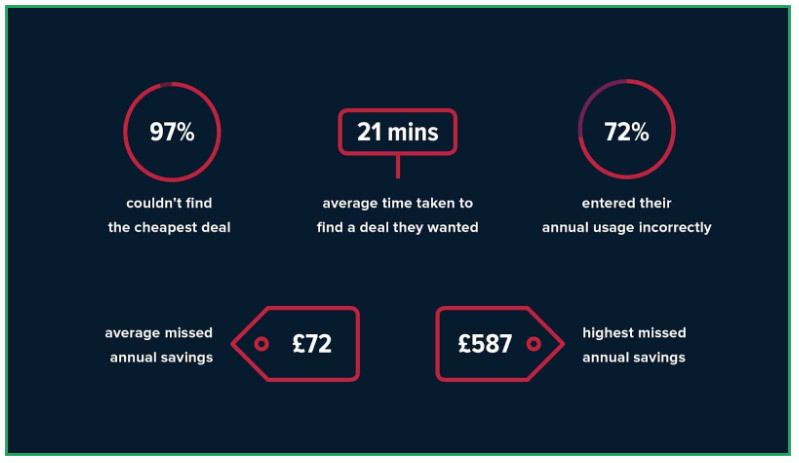 In a recent study, we challenged 88 people to find the cheapest energy deal using the five leading price comparison sites. These are the results; we hope you're sitting down. It took the participants 21 minutes and 54 seconds to find what they thought was the cheapest deal. 96.59% didn’t find a cheaper deal at all. 71.6% entered their annual energy usage incorrectly, proving that people find energy bills difficult to understand. The highest missed annual saving was a whopping £587, while the average missed annual saving was £71.54. When you switch energy suppliers through PCWs, there’s a long and boring process involved. You have to enter lots of details, compare prices and choose a deal from a list of suppliers (not always the best deal at that). Then, you’ll receive some paperwork to fill out, and you might have to call up your supplier and do the whole switch process yourself. With automatic energy switching (what we call flipping), you sign up once and are flipped to the best deal, continuously. Traditional Switching is static, manual and involves you spending time filling out forms and you don't even get the best deals. We launched auto switching back in 2016. We knew we were doing something so different it needed a new name. We chose to call it ‘flipping’. We love the idea of flipping so much; we named our business after it—Flipper. The concept is new and different, and we get asked lots of questions, so let’s clear up a few bits. I have to pay a fee to use Flipper, but PCW’s and other auto-switchers are free? They aren’t free. Most energy switching websites work on a commission basis - meaning that they get paid by the supplier you switch to. PCWs and other free switching services only show you the deals that suit them so you could be missing out on £££. Search for deals from all Ofgem approved energy suppliers in the market, which is far more than any commission-based or ‘free’ energy switching website. Flip you as soon as a better deal is available - rather than needing to wait for the supplier to earn their commission. Your £30 annual fee is only taken once we’ve found a deal that saves you at least £50 and on average our members save £385 every year. We don’t just find you a good deal and flip you to it, We check the market every month on your behalf and if we find you another saving of at least £50, we’ll flip you again. Will I be charged every time I’m flipped to a better deal? ‍No, you only pay your £30 subscription fee once each year. Can I choose which energy supplier you flip me to? How do I sign up to Flipper? Enter your postcode, current spend and energy supplier and we'll show you an estimated yearly saving. (Savings are based on Ofgem averages). Then we'll ask for some more details about your supplier (this will take two minutes). You'll get an email from us once we’ve found you a saving of more than £50. We see our customers as ‘members’. And as a member, you’ll have access to your Flipper dashboard. Members can use the Flipper dashboard to update details, pay bills, get supplier information and submit meter readings. All this, all in one place. With Energy price comparison websites you have to do the legwork: compare prices, choose the deal (which may not be the best), fill out paperwork and manage it all yourself. This happens every time you make a switch. 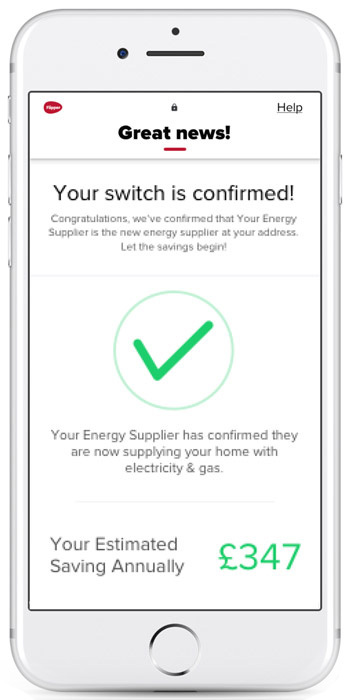 At Flipper, you enter your details once, and we ‘flip’ you to the best energy deal, whenever we find one that saves you another £50 or more. No phone calls, no paperwork, no hassle.